This is the nave facade of the Cathedral of St. Augustine. The facade remains from the late-18th century construction of the church, so it predates the fire of 1887. The building is listed on the National Register of Historic Places. 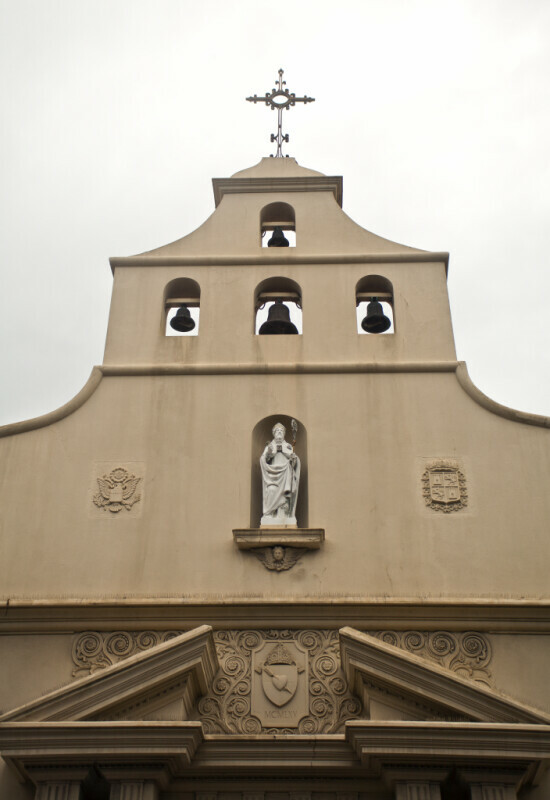 However, some elements have been added to this Spanish Mission style campanile, such as the Great Seal of the United States. These were likely added during restorations, in the mid-1960s. The church was made a minor basilica, in 1976. There is a statue of Saint Augustine, in a niche, above a broken pediment. Here is an escutcheon, emblazoned with an arrow-pierced heart and topped with a mitre, within the gap of the broken pediment. To the right of the statue, there is a relief of the simplified coat of arms used by the Kingdoms of Castile and Leon. There are four bells.